As technology continues to evolve, so does the quality of the simulation and entertainment experiences in the home and commercial sector. With higher resolution images and better sound quality delivered across high-speed broadband, the feeling of a live performance is closer to reality than ever before. By taking advantage of these combined developments, and adding in some magic, a new user experience has emerged. Simulation, movies, video games, sports and photographs take on an air of realism, turning what was once a blank wall into a large as life â€œentertainment window.â€ The beauty of the new projector is that it requires no special tools or construction to install and operate. Furthermore, unlike other projectors on the market today, it is designed to blend into a living space, as naturally as an entertainment console. 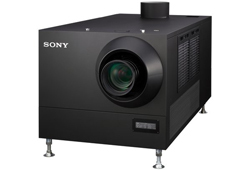 It also has the ability to display current video content services from IP, satellite or cable providers as well as 4K content sources including Video Unlimited 4K, Netflix and 4K content shot on Sony's expanding range of 4K Handycam camcorders.